Employees are truly a valuable resource. Regardless of the type of business you operate, or the country in which you operate, every business depends on having qualified and experienced people to reliably perform all of the tasks required by the business. It is undoubtedly true that some employment positions are more important, more vital, and contribute more directly to the overall success of the business than others. A highly competent Production Manager in many cases is more vital to the business than a General Manager or Finance Manager, because his / her company – specific technical and operational skills and leadership are key to the successful daily operation of the business. In many cases these skills cannot be replicated by an outside hire or an internal promotion without many months or years of intensive training. However, if your business has any employees or positions that are truly non-important, than as a Manager you are being irresponsible for maintaining such positions or employees. Is the cleaning lady (or cleaning person to be politically correct) a vital position? Probably not, because an outside hire (direct employment or contract) can successfully mobilize in the position and be effective with not more than a few hours of orientation. But don’t make the mistake of thinking of a cleaning lady as being a non-important position. Try running your office or business for a few days without anyone to clean the toilets, canteen, and general office area, and you will quickly discover just how important this function is to a happy and healthy office environment. I fondly recall one cleaning lady who worked at a factory that I managed nearly 20 years ago. She was a contractor, supplied by a maid service company, and was one of the longest serving members of the office staff. I was very proud to attend the wedding reception for her daughter, and all of us were very sad when she retired. Many tears fell in the office and around the factory site on her last day of service. The cleaning lady wasn’t the only member of the factory “team” that had served devotedly and loyally for many years. We were very proud to have quite low turnover on our team. Thailand, where this factory was located, and where I have lived and worked for many years, has an entrenched culture of job hopping across all levels and positions. I have probably interviewed well over 1,000 employment candidates, and I have undoubtedly reviewed several times that number of employment applications. In the vast majority of cases, I observed that candidates changed jobs every 2 to 3 years. I rarely received an application from a person who had been employed by the same company for more than 5 years, let alone 20 or 30 years. Long service employees do exist, but once an employee has stayed with a company for 4 or 5 years, he / she is quite unlikely to resign except in the case of a significant change in company environment. Such change could include financial distress, a change in technology or operation that significantly alters or eliminates the incumbent employee’s position or job responsibilities, or a change in leadership or ownership that significantly changes the culture and social environment of the workplace. Can your company survive and achieve its full potential, if you must replace every employee, including staff, supervisory, and management positions, every 2 to 3 years? Can you provide best service to your customers and shareholders when key positions are vacant, and experienced incumbent personnel are long gone before qualified candidates can be recruited to fill the vacancies? How do you train new employees to fill positions when the experienced former employee is long gone? Managing an industrial business, serving customers, and defending your market share against competitive challenges is difficult enough when every position on your organizational chart is filled with qualified personnel. You don’t need the additional headache of staff turnover, recruiting and training replacements, and dealing with team morale issues associated with a revolving door work environment. If these issues are all too familiar to you and your team, you must urgently find a way to promote long term loyalty and employment retention. Staff retention is a complex and diverse subject. However, it can be boiled down to some simple concepts that can be applied across countries, cultures, and industries to minimize turnover and maximize staff satisfaction and loyalty. I hear many managers complain that their staff will quit their position for a few percentage point increase in salary at a new company. I don’t doubt that this is in many cases true. However, I think many managers interpret this phenomenon in the wrong way. Most employees are not so focused on compensation that they will quit a secure position to face unknown challenges at a new company for a 2% increase in basic salary. More accurately, such employees are so dissatisfied or feel so disconnected from their current employment that it only takes the most minor incremental incentive for them to risk the unknown. In these cases, if employment conditions were to degrade further, these employees would even accept a cut in basic salary to escape from the drudgery of their current employment experience. Look in the mirror, evaluate the employment environment that you are providing to your employees, and understand that the problem isn’t your employee’s attitude, but rather the environment that you are providing. In other cases, employees report resigning from their current position to seek “advancement” or promotion elsewhere. If you are managing a trade school, college, or university, you should be proud to train your “students” to best serve their future employers. However, if you are running an industrial enterprise, you must train employees to excel in their current roles, then carefully provide a career path, mentoring support, and encouragement to enable your valuable employees to grow into more responsible and challenging roles. When an employee truly excels in his or her role, organizations often think of such employees as “invaluable”. However, they then proceed to treat these invaluable employees as hardware, plugged into a position with the expectation that they will stay plugged in until they become obsolete or burn out and require replacement. Unsurprisingly, these high performers quickly discover that other organizations also value their skills, experience, and motivation, and are willing to provide incentives including compensation and a positive work environment, to liberate them from their current indentured servitude. I personally believe that high performing individuals have earned the privilege of being promoted in recognition of their performance. In many cases, a linear promotion opportunity may not be available. A lab technician at your facility might excel and eventually achieve the position of lab manager. They appear to have reached the pinnacle of their career ladder, at least within the confines of your organization. However, if you ignore the career aspirations of such a high performing individual, you can be sure that eventually your lab manager will resign “seeking advancement”. A few years ago I ran into a former colleague who was the lab supervisor in one of my factories. Shortly after I left this company, she also moved on. When I met her in a popular restaurant, she was surrounded by colleagues, all wearing the same business uniforms. I was very proud to learn that she was the Plant Manager of a well-respected petrochemical complex, and she was enjoying lunch with her loyal subordinates. Do not place artificial limits on your valuable employees. Allow them to grow, including providing them with opportunities to branch out onto parallel career paths. Or resign yourself to being a charity training institute serving the interests of your competitors and regional peer organizations. Retention is not just about compensation and advancement. These are certainly very important aspects of retention, but by themselves they are not sufficient to create long-term employee loyalty. Most people, especially in collectivist cultures, greatly value connection and engagement with fellow team members. Creating a happy workplace, with an inclusive and supporting culture, is perhaps the most effective way to promote employee retention. Does your company have a culture? Can you describe it? Do you manage and promote your company culture? Do you even give any consideration to the cultural environment of your company? If your culture is “just another company”, a bunch of people punching the clock, doing their jobs, following procedures (or perhaps shortcutting procedures when not being closely supervised), then going home or to the pub to complain about the drudgery of their positions, then don’t expect to have any success retaining staff. Creating a company culture takes time and effort, but it certainly doesn’t require a significant budgetary commitment. Evaluate what type of workplace environment your team would most appreciate. Treat your employees as valuable members of a team working towards a common goal. Define the goal(s), and provide objective metrics so the team can understand and evaluate their performance. Involve your team with your operating strategy, at least to the extent that is safe and prudent with respect to corporate intellectual property and financial reporting regulations. Find ways to treat your employees as fellow shareholders and stakeholders. Solicit suggestions from your team, give them serious consideration, implement worthwhile suggestions, and publicly recognize all valuable contributions. I have been in factories where employees had no idea how their product was used by customers, or how important their product was to their customer’s success. How does your product contribute to society? If your factory makes rubber blades for windshield wipers, your product might seem to be low tech, simple, and nearly insignificant in the broad scheme of human endeavors. However, that simple blade of rubber represents an important component in each car produced by your customer. If your team doesn’t deliver the windshield wiper blades on time and fully compliant with quality parameters, the car manufacturer can’t deliver completed cars to their customers. The car owner and drivers also depend greatly on the quality and performance of the windshield wiper. A defective wiper can easily become a major factor in an accident, and innocent people might be injured, crippled, or killed. Frankly, there are no unimportant products … if your product has no significance to society, you will very soon be out of business. Be sure your team understands and appreciates the important contributions their work makes to a well-functioning society. You undoubtedly have a sales team. I typically observe that the sales team is completely isolated from the operations team. They might as well be working for a completely different organization, serving markets and customers on a different planet. This is terribly unfortunate, because in order for the sales team to proudly and effectively represent your product or service to customers, they must understand and appreciate the hard work, dedication, and attention to detail that goes into producing these products. Likewise, the operations team needs to understand and appreciate the importance and unique value of the products that they are producing, and how important each team member’s contributions are to the overall success of the product and company. I strongly recommend that you routinely send your sales team into the factory to “sell” your products to your operations team. Teach the team about your customers, how they use your products, what they value in your products and how your products compare with competing products. And insist that your sales team frequently visits the factory floor to gain first hand experience about the product and production process. These modest activities will significantly boost the loyalty, pride, enthusiasm, and effectiveness of all members of your team. Regardless of industry, country, or market, I do not believe that any company has to accept high turnover as an insurmountable fact of corporate life. As a responsible, enlightened manager you must seek to clearly understand the factors contributing to employee turnover, and you must create an environment and culture in which your employees feel safe, secure, comfortable, and confident. You and your company will never realize its full potential without a loyal, stable, motivated, and happy workforce. 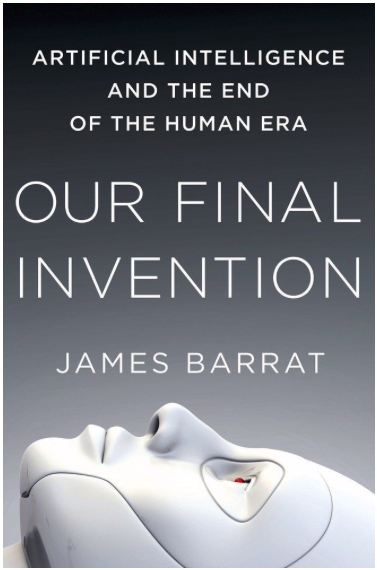 This book is a fascinating study of the history of, and future outlook and impact of Artificial Intelligence. 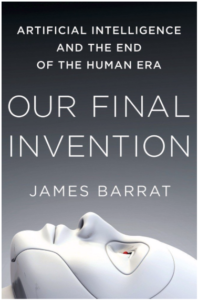 Barrat carefully and thoroughly outlines the history of machine intelligence, the ongoing development of artificial intelligence, and the future prospects for thinking machines. Barrat introduces the concepts of Artificial General Intelligence (AGI) and Artificial Super Intelligence (ASI). Basically, as machine intelligence technology improves and matures, computers will soon achieve AGI. AGI is characterized as a computing system having overall intelligence generally equal to that of a human. AGI will represent a highly significant milestone in computing technology and capabilities, as for the first time computers will be able to fully replace humans in most intellectual endeavors. Barrat proposes that the era of AGI will be comparatively short. AGI will be capable of perpetuating human design and development of ever more capable computing systems. However, unlike humans, AGI computers and systems can be almost infinitely replicated and interconnected. This will enable AGI systems to utilize human level intelligence much more effectively and efficiently than biological humans. AGI will therefore quickly develop ASI technology, wherein computing system will become almost infinitely more intelligent and intellectually capable than any individual human, quickly exceeding the combined intelligence of all of humanity combined. Ray Kurzweil’s milestone book “The Singularity is Near (2005) defined the concept of the Singularity as a “singular” period in time (beginning around the year 2045) after which the pace of technological change will irreversibly transform human life.” Barrat reviews Kurzweil’s theory and prediction, and explains how ASI will be the technological driver of the singularity. Both Baratt and Kurzweil discuss the S-curve concept of technological development. Technological development does not proceed in a linear manner, but rather grows and develops exponentially, until the technology reaches the pinnacle of its development. Computing technology has already achieved very significant capability, and machine intelligence algorithms are currently in wide use and making great contributions to our current quality of life. While today’s computing systems are still far from achieving AGI level of capability, the exponential growth curve means that the AGI milestone will likely be realized within the next decade or two. Baratt devotes a significant portion of his book exploring the potential benefits and dangers of ASI. Will ASI computers be satisfied to continue to serve human masters, or would such super intelligent sentient entities view humans as a child-like lifeforms to be dominated, enslaved, or potentially exterminated? This book has received a great deal of public interest, discussion, and debate in the past few years. It is well-written, easily digested, and very thought-provoking. I highly recommend it for managers, and for anyone who has in interest in the future of technology and its significance for the future of humanity. Managers are faced with a great number and diversity of issues each day. Many of these issues require prompt resolution typically in the form of a decision or direction to be issued by the Manager to subordinates. Good managers recognize that they must base their decisions on an objective, non-biased consideration of relevant facts and circumstances, always seeking to act in the overall best interests of the organization. Unfortunately, most managers don’t have the luxury of time and tranquility required to give each issue ample and careful consideration. Major and minor issues constantly arise in a seemingly relentless manner, and our intrepid manager must consider each issue as quickly and efficiently as possible, render a judgment or decision, and hope for the best. Modern managers are (still) human. Artificial intelligence is not yet wielding significant influence over the decision-making process. Even the most well-intentioned and highly experienced managers are influenced by personal and organizational biases, historical precedents that may have been based on faulty premises, and pressures from subordinates or other influencers that may have motivations far removed from the best interests of the organization. One can wish to forgive managers for not giving each issue ample and careful consideration before passing judgment. Clearly, not all issues are of vital, longterm interest to the organization. However, one must be very mindful that even seemingly minor decisions can serve as precedents upon which future issues will be considered and based. This can be especially true when a decision is related to, or can be consciously or unconsciously perverted, to serve the self-interests of the manager or other stakeholders at the expense of the Company’s best interests. These decisions that support misaligned interests often appear to be of only minor significance and importance, and self-interested parties may actively seek to emphasize the limited significance and impact of the issue in hopes of receiving the desired decision. The less time and effort a manager invests to understand any given issue, the less likely it is that the manager will appreciate the broader or longterm ramifications of the issue. This may sound philosophically interesting, or mind-numbingly boring, depending on your personal perspective. A common example might serve to conveniently highlight the issue. Every modern office has numerous PC’s, laptops, monitors, printers, mobile phones, and other electronic devices. These devices typically become obsolete before they physically break or cease functioning. It is not uncommon for subordinates to request permission to purchase such obsolescent equipment, and in many countries it is quite common for companies to sell obsolete equipment to employees at bargain prices. Is this in the best interest of the company? Is this in the best interest of the employees? How should a manager consider an issue such as this, and are there any biases or misaligned incentives that could adversely influence the decision-making process? The company’s best interests are served if all capital assets are utilized to their fullest potential. If an asset should become non-useful to the organization, the asset should be disposed of in the most appropriate manner, to generate salvage income from the asset, to protect the community and environment from adverse environmental impact, and to always recognize and respect any employee or stakeholder impact or preference. In the case of a common laptop PC, a well-cared for laptop can function well for many years. Some maintenance may be required during the lifetime of the device, such as battery replacement, memory and/or data storage upgrades, keyboard or display service, etc. Eventually, the performance of the device may no longer satisfy the operational requirements of the user, or the cost to maintain or service the device may exceed the value of the device or may be non-competitive compared with the cost of a new replacement device. In a well-managed organization, commodity devices such as laptop PC’s can be reassigned to different users or applications to match their performance and condition to the user or application requirements. A top of the line laptop that was suitable for a power-user such as an engineer, field service technician, external sales person, or the ego of an executive when it was purchased new may become completely inadequate for these same functions and applications just 2 or 3 years later. However, many users or applications to not require high performance, especially now that many applications are moving to cloud-based solutions. A basic laptop, even one that is 5 or 6 years old, can still run web browser software suitable to support nearly all cloud-based applications. Even a laptop with a malfunctioning display or a failing keyboard can be very satisfactorily utilized by attaching an external monitor, keyboard, and mouse. For most organizations and applications, nearly any functional laptop, desktop, or printer can continue to be satisfactorily utilized by properly matching the aging device to the application. And when a device does fail, it can become a source of spare parts for remaining identical devices, assuming that the organization has prudently managed its device procurement strategy to standardize on equipment. Frankly, if such a device is still functional, or still has useful parts that could be used to maintain similar devices, it should be retained by the organization. When a device no longer has any value to the organization, it should also be expected to offer very little value or interest to employees or other entity except specialized recycling contractors. So why do so many organizations sell functional (or even non-functional) used equipment to employees? I strongly suggest that in most cases, these decisions are being made based on misaligned incentives. Supervisors and managers are incentivized to offer used equipment to employees to promote good relationships with employees. Whereas managers should be making decisions on the basis of the best interests of the company (and happy employees are certainly in the best interest of the company), they are actually making these decisions based on self-interest, or being influenced by supervisors or subordinates who themselves are acting out of self-interest. Does sale or auction of used IT equipment such as laptops to employees promote good relationships? Undoubtedly, there are some employees who would appreciate the opportunity to purchased a used device from the company at a bargain price, especially if the device is being offered well before it has actually reached the end of its useful life. However, the company should also seriously consider whether such a used equipment sale policy can be administered in a way that is fair for all employees? If this program is beneficial to employees, meaning that the employees can purchase the used device for a bargain price compared with other retail sources of such used equipment, then it only benefits those employees who have the interest or opportunity to participate. Employees who are not interested in used IT equipment would not benefit. How many creative programs would the company need to implement to ensure that all employees with their many diverse interests would have an opportunity to receive an equivalent benefit from the company? Good employee relationships cannot be promoted and sustained by special programs that only benefit a small percentage of the workforce. Environmental protection is certainly an important area of best interest for a company. e-Waste is rapidly becoming a global environmental problem, and companies should ensure that their e-Waste is properly managed to minimize environmental impact. Even a small company has the resources and ability to engage with a qualified e-Waste contractor to dispose of such devices at the end of their useful life. In many cases, companies can recover a salvage value from devices that are consigned to an e-Waste contractor. However, most individual consumers are unable or unfamiliar with e-Waste solutions, especially in less-developed communities and countries. It can be easily argued that a company is failing in its environmental responsibilities when it sells, donates, or otherwise distributes e-devices to individuals or small organizations (such as churches or charity groups) that cannot or most likely will not ensure that these devices are properly recycled when they do reach their rapidly approaching end of life. I have observed that when management implements a policy to recycle all end-of-life IT equipment utilizing a qualified e-Waste contractor, the quantity of such devices selected to be recycled significantly drops. Departments are suddenly eager to receive an old laptop or desktop that is no longer suitable for its previous function, to address unbudgeted needs or to help stretch their department budgets. Once the misaligned incentive to dispose of useful equipment is removed, incremental value can continue to be extracted from aging but still useful equipment. To avoid misaligned incentives, managers should always carefully and critically evaluate any program or proposal that seeks to create a benefit or satisfy any unmet need or expectation in a manner that is not absolutely straightforward and transparent. The more lobbying pressure a manager receives in support of a proposal, the more careful and critical the manager must become. Do not yield to popular pressure. Never allow or attempt to create or support any program that seeks to benefit any group of employees by bypassing the budgeting process. If a program is worthwhile and in the company interest, it should be supported by a budget allocation, and all employees should have the opportunity and expectation to realize equal benefit. Many managers, probably a majority, disagree with my position concerning sale or auction of used IT equipment. I continue to believe that this is a classic case of misaligned incentives influencing policy decisions. I strongly recommend that managers diligentlyavoid implementing misaligned policies such as this. If your organization already has such policies in place, I strongly recommend that you start taking steps to eliminate these misguided programs. If you feel that your employees need and deserve incremental benefits, then create a new benefit or supplement existing benefit programs designed to positively impact all employees.